Hi everyone, I am new to the kawi scene. I have been riding honda 250rs for the past couple of years and i am looking into getting a kfx450r. I am in need of a replacement filter for a fuel customs intake. all the performance parts getting parted out. the guy said he just threw the filter away for his fci. I cant imagine listening to the motor and test riding it without the filter. 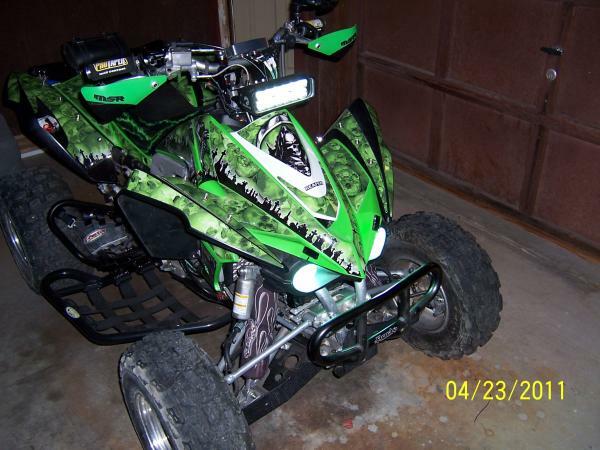 I know nothing about these quads as far as what i should be looking for when buying one of these. I am new to fuel injection but need it for the mountain trails. I would be greatful for any help with the air filter and buyers inspection tips. thank you. Can you find a KFX foam filter & cut it to size and fasten it with a 4-1/2 Hose clamp for the test ride...Is the only thing I can think of...!! thank you for your reply. so i need to find a foam filter for the kfx450r original airbox and cut the rubber boot down to make it fit the larger airbox inlet? thanks again, for your help. thank you, after looking at the oem filter i see what your talking about. will a gytr cone filter fit? You only need an KFX stock filter that's foam & stretch it over the FCI tube....cut it to fit & clamp it with an hose clamp...Or duct tape on the tube... if it only (temporary) to test ride the KFX before purchase...! !